Der Sieger ist Jan Tomcani. Herzlichen Gl�ckwunsch und viel Erfolg in Washington D.C.! Der Sieger ist Moritz Gross. Herzlichen Gl�ckwunsch und viel Erfolg in Washington D.C.! Der Sieger ist das Team um Matthew Nass, Jacob Wilson & Jesse Hampton. Herzlichen Gl�ckwunsch! Neben der Text-Coverage gibt es auch eine Live-Video-Coverage via Twitch. Die Kommentatoren sind Marshall Sutcliffe, Brian David-Marshall, Randy Buehler, Rashad Miller & Richard Castle. F�r weitere Infos siehe das GP Nashville Fact Sheet. Der Sieger ist Eduardo dos Santos Vieira mit Abzan Midrange. Herzlichen Gl�ckwunsch! F�r weitere Infos siehe das GP Santiago Fact Sheet. Der Sieger ist Ivan Jen mit Jeskai Heroic Combo. Herzlichen Gl�ckwunsch! Der Sieger ist Joseph Moreno mit Dredge. Herzlichen Gl�ckwunsch! Der Sieger ist Alan Marling mit Affinity. Herzlichen Gl�ckwunsch! 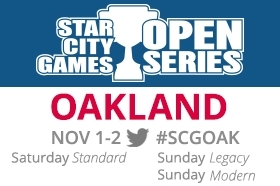 F�r weitere Infos siehe das SCG OS Oakland 2014 Fact Sheet. Alle Teilnehmer, die 39 oder mehr Punkte erreichen, bekommen 4 Pro Punkte (vorher waren es 3 Punkte). Alle Teilnehmer, die 36-38 Punkte erreichen, bekommen 3 Pro Punkte (vorher waren es 2 Punkte). Alle Teilnehmer eines Team-GP, die 31-32 Punkte erreichen, bekommen 2 Pro Punkte (vorher war es 1 Punkt). Alle anderen zu vergebenen Pro Punkte bleiben unver�ndert. Die �nderungen werden r�ckwirkend zum Start der aktuellen Saison, die mit den GP Utrecht & GP Portland am 09.-10. August 2014 begann, in Kraft treten. - Mit anderen Worten, der eine oder andere wird wird feststellen k�nnen, dass er nun ein-zwei Punkte mehr auf seinem Konto hat! 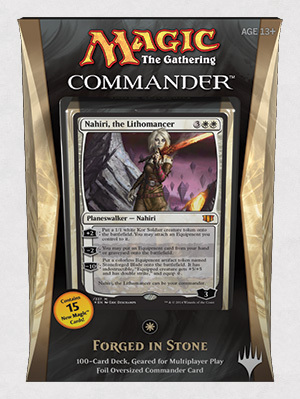 Das waren die letzten drei Commander 2014 Preview-Karten, denn die offizielle Card Image Gallery ist voll und die f�nf Commander-Decklisten wurden auch schon ver�ffentlicht! monobeartheater: rairatrio: please stop romanticizing skeleton hell um? no? [+]monobeartheater: rairatrio: please stop romanticizing skeleton hell um? no? [+]Why am I sitting here working on 2 decks in different formats that I never get to play instead of prepping for this damn limited PTQ I’m playing in tomorrow. Me: Ok so I'm gonna give Jareth, Leonine Titan protection from white. You once described the philosophical conflict between black and green as free will vs determinism; could you help explain the difference between that and the nature vs nurture conflict with blue? [+]Green/blue?s conflict is about your identity. Black/green?s conflict is about your role. [+]I did one on cycling.�: ) I?ll get cycles one of these days. 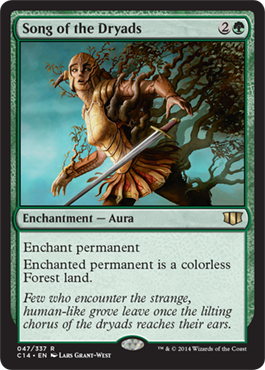 Was elemental ever considered for greens iconic? I mean I know they are also in red and hydras are already amazing, I just wonder if it was a thought. [+]Iconics want to be things primarily in one color. Could Phyrexian ever become a creature type? [+]I think we?ve passed the window for it. There?s just too many Phyrexians that don?t have it. I read a while ago that dinosaurs were tried as green's iconic. Why did they not succeed? Dinosaurs are awesome. [+]Dinosaurs have not been tried in game as an iconic. They are problematic in that the would feel out of place in most worlds. [+]The best way to learn a system is to work within it. How much design space is there for non-red monocolored dragons? [+]Historically, we?ve made numerous cycles of dragons a few of which were monocolored. [+]Every card does not have to be the best that we can do. In fact, doing that leads to power creep which is bad for the game. If you were rebooting Magic, would you tweak the colour pie so that different colours are primary in card draw and counterspells? Would you put last strike (and then triple strike) in an Un-set? is looting still available to blue or is it strictly red now? [+]Looting is both blue and red. Blue draws first, red discards first. Couldn't Sylvan Library be mono black? Or is it because of the top manipulation (blue) coupled with trading life for cards (black)? [+]Black pays life for cards but it doesn?t filter the top cards of the library. Did you create Yawgmoth or was that someone on 'continuity's' creation? Frage (16588): Kann ich mit Nullifizieren (Nullify) ein Wetzrad (Whetwheel) neutralisieren, das per Morph verdeckt gewirkt wird? [+]It?s a pretty card as is and it?s not going to be in Standard or booster drafts, so we felt reminder text wasn?t necessary. [+]I?m really not that guy. I think Mirage was legal in Standard the last time I really played it. Temporal Aperture is probably my favorite card ever printed. 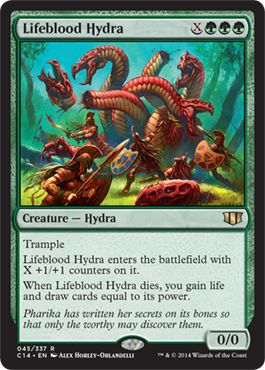 What's the likelyhood of it getting reprinted in standard? [+]There are no developers conveniently located in my apartment to ask, but I?ll guess unlikely. While the effect is pretty neat, that much shuffling is not looked upon favorably. [+]The most common response from developers when I shouted out the question was ?Unlikely.? 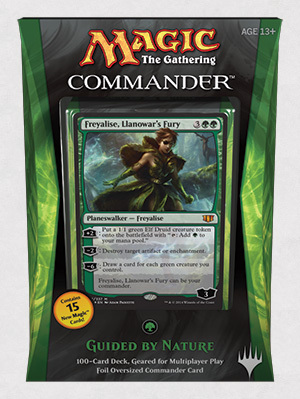 [+]Your commander is still your commander even if it becomes a copy of another creature. 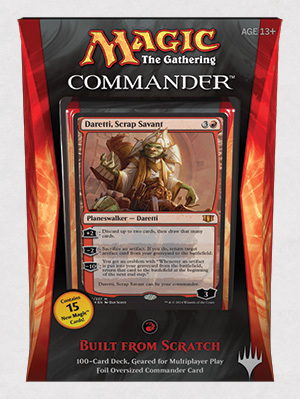 Similarly, copies of your commander are not your commander. How does Deflecting Palm work with Gisela, Blade of Goldnight? [+]If multiple replacements are trying to replace damage being dealt to you, you choose which applies. Maro answering more questions about Jorts. How long until Cena is working for R&D? [+]I can?t see that happening. Do only attacking creatures deal combat damage? E.g., Butcher Orgg blocking a creature. [+]Combat damage is dealt by attacking and blocking creatures. If you block with Butcher Orgg, you can assign its combat damage to you and/or creatures you control. This is usually not a good idea. If you could spend a whole day without having to worry about work or family, what would you soend your time on ? [+]If I had one day, I?d probably sleep. I never get to just sleep. [+]Let?s play a format I?ll call Creature Duel. 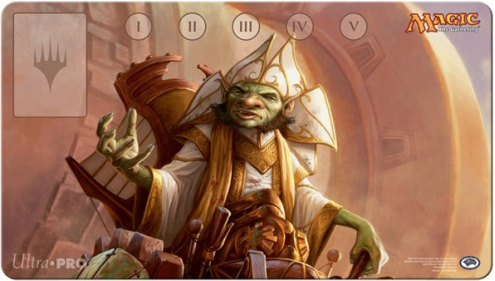 The rules are you can play only basic land and creatures. 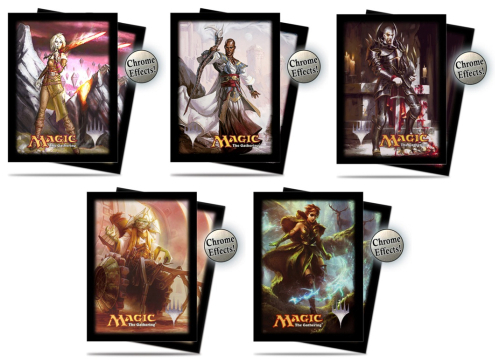 The format uses Standard legal cards. I get the monogreen deck and you get the mono blue deck. Who has a better chance of winning? Can minions still submit for patron saint-ism? [+] solsticesungod: My Halloween costume is a sweet MTG card. I also won Garruk?s Axe as a prize for my sweet costume. Mostly homemade goes a long way. 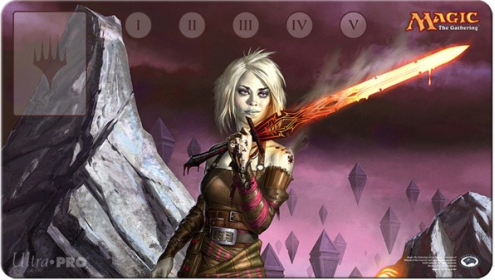 theartofmtg: TheArtofM:tG | SPOOPY Happy All Hallows? Eve! [+] Moonlight Geist || Dan Scott Kessig || Adam Paquette Unmake the Graves || Aaron Miller Woodland Cemetery || Lars Grant-West Ghoulcaller Gisa || Karla Ortiz theartofmtg: TheArtofM:tG | SPOOPY Happy All Hallows? Eve! [+]pukewhenimsad: My roommate, dani kordani, took this cool photo of me! [+]rupertfawcettsdoggyblog: A Country Walk Story of my goddamn life. 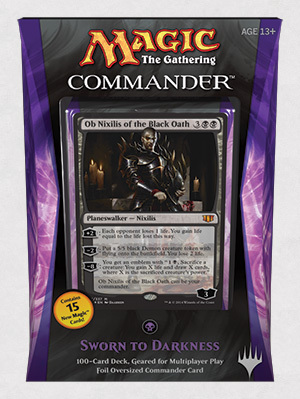 [+]Bennie Smith is here to tell you how to smash your next Commander table in not one, but two ways! Whether you like tribal synergy or blowing away everything on the table, we've got the deck for you! [+]This is a StarCityGames.com Premium Article. Click here to sign up.Sam Black has an eccentric and powerful list with some not-so-subtle hate for the new Modern metagame! Sleeve it up for the $5,000 Premier IQ at #SCGOAK! [+]Nobody was faster to understand the power of Treasure Cruise in Eternal formats than Carsten Kotter. Today, he tells you why we've gone from skeptical to sensationalist on the card and how it's good for the format going into #SCGOAK and #GPNJ! [+]Adrian Sullivan looks at the way different red decks take different shapes in current Standard! Why play one burn spell over another? What do you do when a goofy card is the right answer? 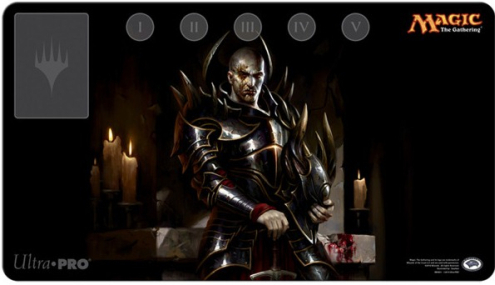 Check out Adrian's current lists before #SCGOAK! [+]This is a StarCityGames.com Premium Article. Click here to sign up.Look out #SCGOAK! These two grinders are in for a grindfest when they take the two most powerful and bulky midrange strategies available in Standard to this new video! [+]Strange contenders and bizarrely tweaked archetypes are starting to sprout from Legacy all over the place! 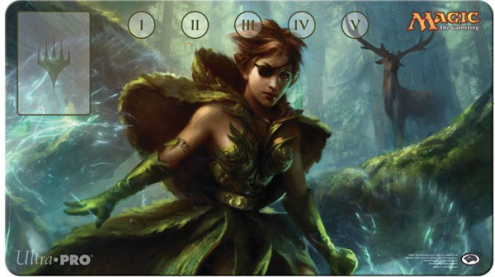 Learn the new metagame with everyone's favorite Versus warriors before #SCGOAK and #GPNJ! [+]This is a StarCityGames.com Premium Article. Click here to sign up.BBD has discovered some amazing Legacy tech that will blow your mind: Treasure Cruise. Okay, maybe that's nothing new, but his ideas about the format and what its still missing are! Check out his work before #SCGOAK and #GPNJ! mtg-talk: Spoilers! So many cool spoilers! [+] mtg-talk: Spoilers! So many cool spoilers! 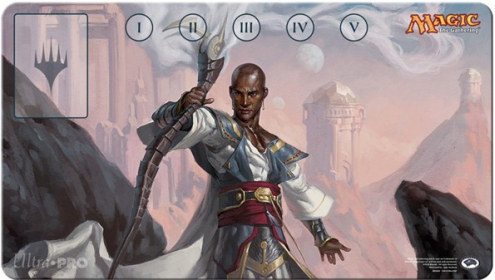 [+]Played Abzan Midrange at FNM last night and went 2-1. Got two packs and pulled Windswept Heath and a foil Battlefield Forge. I’d say it was worth it. Tomo. You are my actual favorite person. I love all of your Kallist art. Please never stop being awesome. [+] Oh I?m flattered You are my favorite person too!WotC should give us�canonical Kallist art btw? 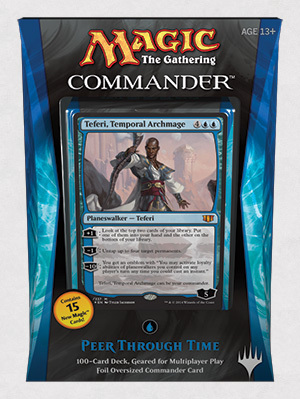 [+]tinker-blightsteel: Tezzeret/Jace ship where Jace plays with some of Tezzeret?s inventions and Tezzeret is like ?You better put that down. You wouldn?t want to kill me.�Again.? Lili celebrates Dia De Los Muertos, looking typically awesome. [+]Lili celebrates Dia De Los Muertos, looking typically awesome. Just hatched a Perfect Pikachu! [+]Just hatched a Perfect Pikachu!